A walk up Whitehawk Hill Road behind the Royal Sussex County Hospital quickly reveals unbeatable views across the city. The Palace Pier can suddenly be seen above the roofs of the seafront buildings below, and then Marine Gate, the Marina and so on. Best of all are the views towards the east from Whitehawk Hill itself, said to be the best place in the city to watch low winter sunsets. Although the area is by no means quiet, it is hardly on the beaten track. 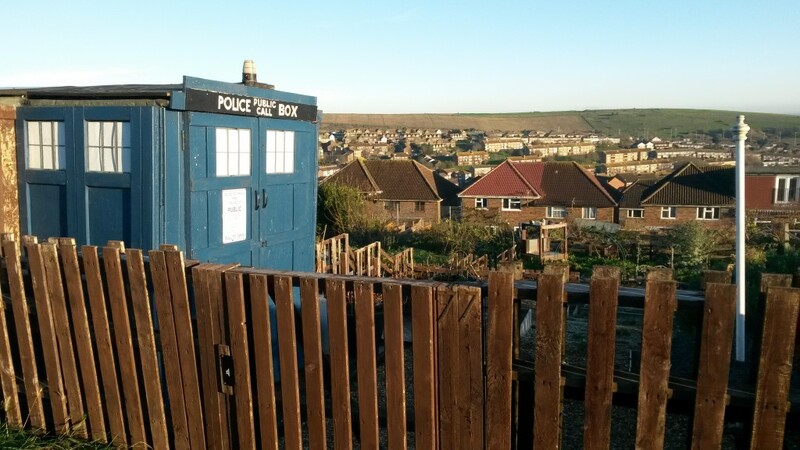 Many residents of Brighton & Hove have never heard of the Craven Vale allotments at the top of the hill and fewer have explored them, which is a real shame as they are quite magical – but sadly under threat as a site for housing. The Craven Vale allotments consist of around 140 individual plots. 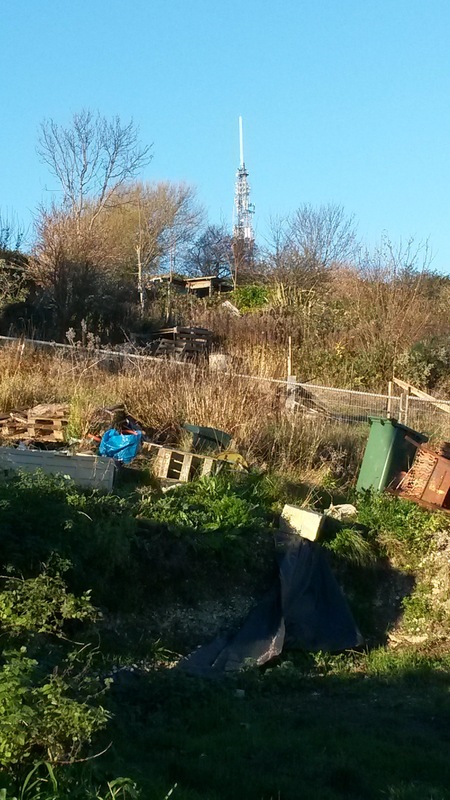 Their status as statutory allotments (which means that development can only take place with the Secretary of State’s permission), and their location beside both common land and the Whitehawk Hill Camp scheduled ancient monument, do make development tricky. Nevertheless, a council-commissioned urban fringe study has identified the site as suitable for housing. I am fully won over by the arguments of campaigners, including site representative and sheep lookerer Jane Hawkins, who strongly make the case for the benefit of allotments generally and the unsuitability of this site for housing. I would add that we should be very weary indeed of allowing any green spaces locally to be built on. If we have to build then let’s go tall elsewhere. I enjoyed my visit immensely and was fascinated to see Whitehawk Hill transmitting station, which opened in 1959 on the site of a World War II radar station, so close. I thoroughly support the campaign to keep this space as it is. When Hove Civic Society was formed during the 1960s, it was a protest group. In recent years, under the chairmanship of Helmut Lusser, the society is now leading the debate by proposing rather than opposing. I have previously mentioned Hove Civic Society’s plans for a plinth for public art on Hove’s promenade which I very much support. I recently met with Helmut to discuss in detail the society’s ongoing project to populate and, in many cases, repopulate our streets with, quite simply, trees. 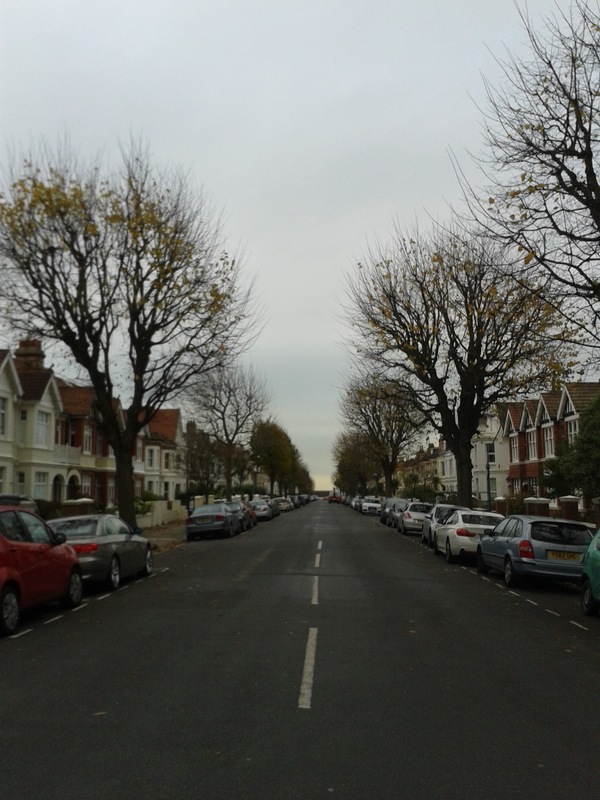 The project really got going in 2012 with a study of Hove’s streets to identify where planting might be helpful. Success was had in December of that year with the planting of 12 elms in the Monpelier area, close to the Brighton/Hove border. In December 2013, 40 trees (hornbeam and smooth-leaved elm) were planted near Stoneham Park. Discussions are now being held regarding Bigwood Avenue and, far more ambitiously, the Church Road area. 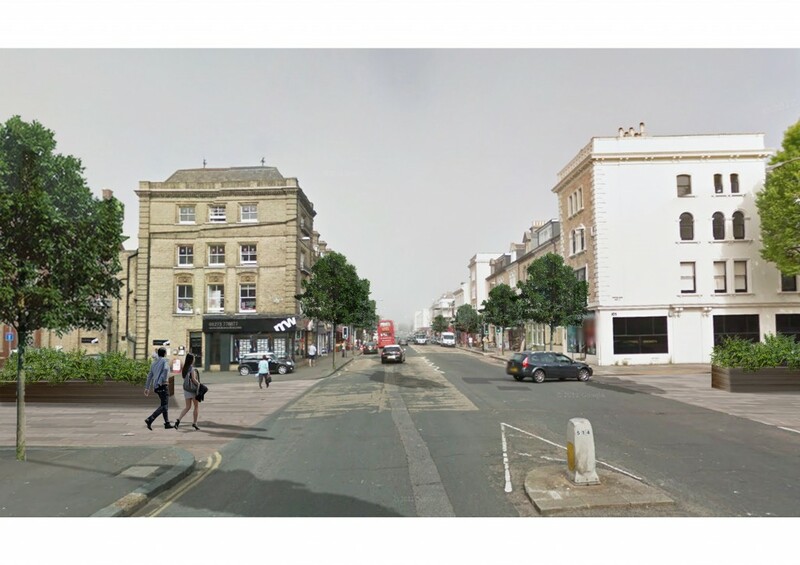 Looking back over old photographs of Hove, it is quite clear that hundreds of trees have vanished over the past century. This is sad as they are hugely attractive aesthetically and assist in providing shade and a haven for wildlife. On boulevards such as New Church Road and The Drive, they are a delight. Trees won’t work on every street. Osborne Villas, a street that I know well, certainly wouldn’t be suitable. The pavements and road itself are narrow and trees would just seem out of proportion. Wide St Aubyns nearby has trees and, despite the generous height of its buildings, seems dominated by foliage. Perhaps its magnificent elms just need cutting back a bit. The project relies on grants, match-funding from the council and donations from kind residents. If you are pining to get involved in any way, contact info@hovecivicsociety.org for more information. The conventional logic when it comes to appreciating the built environment around us is that we should all be looking up more. It’s so easy to miss Regency or Art Deco details above local shops after all. But looking down has its benefits too. 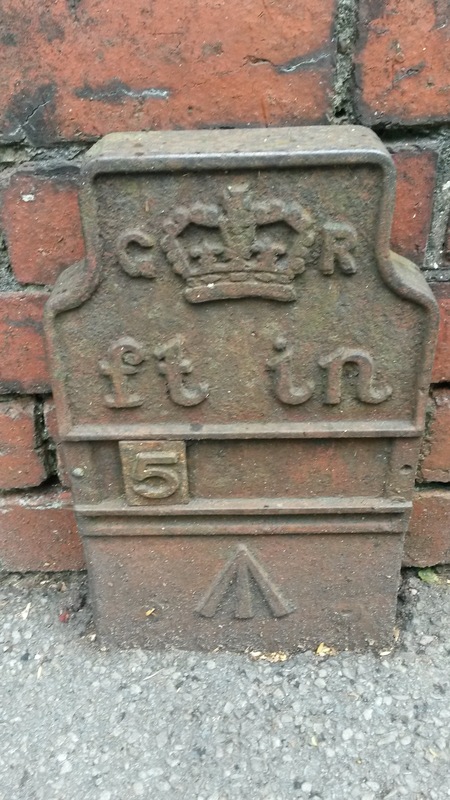 Pavements and low walls are full of interesting features including old street signs, boundary plaques and coal chute covers. The letters ‘FH’ and ‘H’ on walls and small posts denote fire hydrants. 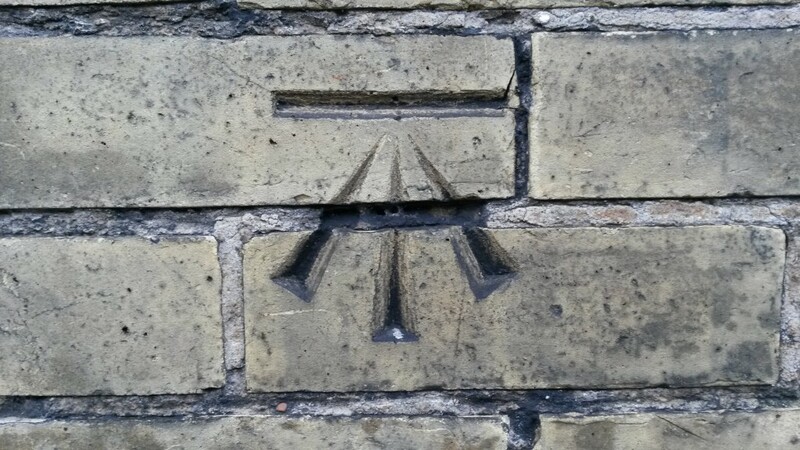 ‘HCS’ and ‘HC’ cut into granite kerbstones once indicated hackney carriage stops. Much more subtle though is a series of small symbols that consist of a horizontal line with an arrow pointing towards it from below. They are Ordnance Survey bench marks. One example is that on the front wall of 56 New Church Road in Hove. It was carved into the yellow brick many years ago. Another sits below a crown on an iron post in front of the Withdean Grange telephone exchange on Preston Road in Brighton. Others exist, according to Ordnance Survey’s database, on Harrington Road, Preston Drove, Balfour Road, Lowther Road and Beaconsfield Villas nearby. They are certainly not rare. The network of symbols was put in place as a reference frame for heights above Ordnance Datum (mean sea level). Numbers on corresponding maps give heights at each point. Although the network is no longer maintained, around 500,000 of these so-called ‘lower order’ bench marks still exist. They are being destroyed though when, for example, walls are demolished or pavements are widened. Ordnance Survey’s list states that the bench mark on New Church Road is a cut mark at 0.7m above the ground and 12.067m above mean sea level (presumably different to that of today). Now that I know what these curious symbols mean, I spot them all the time.